Key features are the most noticeable, significant facts contained in the graph. You should select at least three key features, which will form the basis of your answer. Do not try to mention everything. 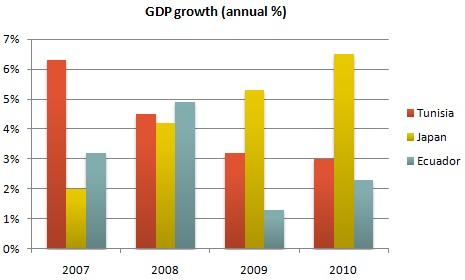 The chart shows the annual GDP growth for three countries from 2007 to 2010. By the year 2007 the figure for Tunisia was by far the highest at close to 6.3% per annum. This figure is double that of Ecuador and three times that of Japan on a global level. However by 2008 this trend has changed considerably; the Japanese doubled their annual GDP over this period and there was also an increase in the GDP of Ecuador, while Tunisia fell to 4.5% per year. In 2009 and 2010, the downward trend for Tunisia continued falling to a low of 3% at the end of this period. For Ecuador, the GDP fell sharply to just under 1.5% in the year 2009 and rose only slightly in 2010 to 2.3%. On the other hand, for Japan, the GDP figure rose significantly throughout this time and by the year 2010 had more than matched the GDP figures for Tunisia of the year 2007.